Self sufficiency in energy requirement is critical to the success of any growing economy. With increasing energy consumption, dependence on fossil fuels will necessarily have to be reduced. Being the fifth largest energy consumer, India imported nearly 70% of its crude oil requirement (90 million tonnes) during 2003-04. Estimates indicate that this figure would rise to 95% by 2030 India has rich biomass resources which can be converted into renewable energy. The Planning Commission, Govt. of India, has launched an ambitious National Mission on Biodiesel to be implemented by a number of government agencies and coordinated by the Ministry of Rural Development. The Mission focuses on the cultivation of the physic nut, Jatropha curcas, a shrubby plant of the castor family. The seed contains 30-40% oil and can be mixed with diesel after trans-esterification. 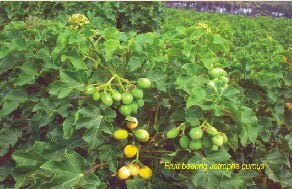 Initially Jatropha cultivation will be demonstrated on 0.4 m ha of wasteland area across the country. The entire cost economics is dependant on the productivity, quality and performance of the raw material. The Government is also discussing a National Biofuel Policy. DBT has been entrusted through a micro-mission with the task of developing technologies that convert fiber, starch and sugar from woody plants and agricultural wastes into useful biofuel products. The thrust is on developing ethanol using lignocellulosic waste as raw material, identifying recombinant microbial stains for enhanced ethanol recovery, producing high quality raw material for biodiesel production and developing the enzymatic trans-esterfication process for more efficient conversion of oil to biodiesel. For the first time, a systematic scientific survey, characterization and collection of superior accessions of J.curcas from across the country has been taken up. More than 1500 accessions have been collected and characterized. Nurseries have been established at 12 locations for providing quality planting material to the National Mission. Nearly 0.8 million quality plantlets have been planted over an area of 300ha. A special focus is being given to crop improvement and on genes involved in oil biosynthesis. Other 'petro-crops' being investigated include Karanja (Pongamia pinnata), toothbrush tree (Salvadora persica) and Mahua (Madhuca indica) With continued policy support and vigorous technology, biofuels could very soon be breathing new fire.